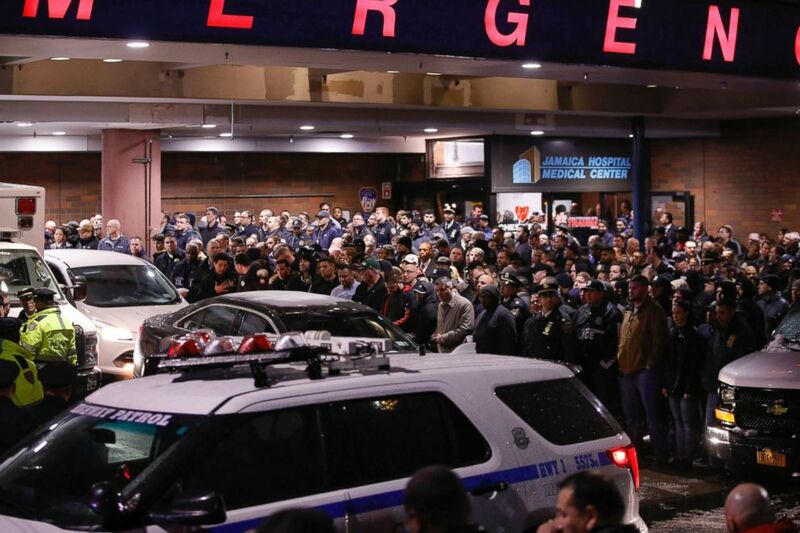 The New York Police Department is in mourning after a detective was shot and killed by friendly fire when seven officers fired 42 rounds during a chaotic armed robbery. "We lost a dedicated, true hero," Police Commissioner James O’Neill said in a Wednesday statement to the NYPD. 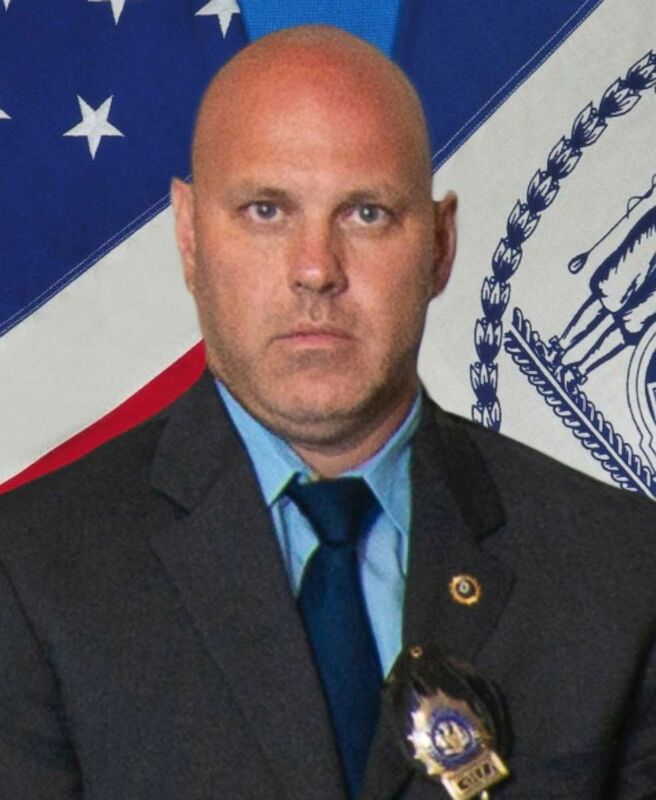 Detective Brian Simonsen was fatally shot by a fellow NYPD officer at a Tuesday night robbery at a Queens T-Mobile store, according to police. Despite what he called a "tragic case of friendly fire," O'Neill squarely blamed the detective's death on the actions of the suspected robber, described by O'Neill as a "career criminal." Simonsen, 42, was an 18-year veteran assigned to the 102nd Precinct in central Queens. (New York City Police Department via AP) Det. Brian Simonsen is seen in this undated file photo. 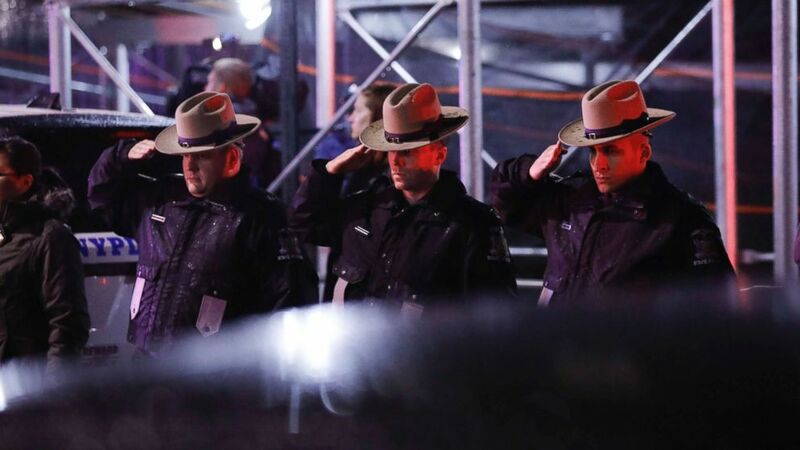 (Kevin Hagen/AP) Officers salute a procession as the remains of slain Detective Brian Simonsen are removed from Jamaica Hospital, Feb. 12, 2019, in the Queens borough of N.Y.
Simonsen was his precinct's union delegate and attended a union meeting earlier on Tuesday, so he didn't have to respond to the fatal call, authorities said. But he did anyway, concerned about an ongoing robbery pattern in the neighborhood, authorities said. New York City Mayor Bill de Blasio said he spoke to the slain detective's mother and wife. "You can imagine how devastated they were," the mayor said Wednesday. "Officers like detective Simonsen put their lives on the line for us." De Blasio said he listened to the 911 call from the reported robbery in which a man with a gun allegedly took people hostage in the back of the store. 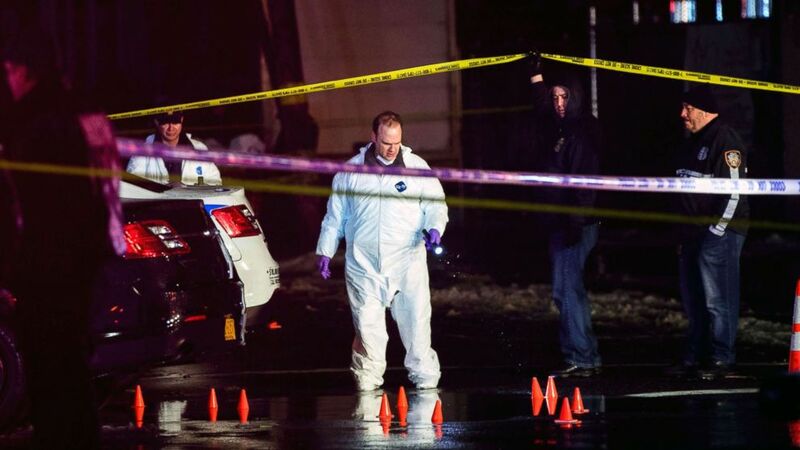 (Kevin Hagen/AP) Investigators look over the area after a two New York City police officers were shot while responding to a robbery in the Queens borough of N.Y., Feb. 12, 2019. "That could have been any one of us who happened into a store," he said. "Officers come and put their lives on the line to make sure we survive. That's what detective Simonsen was doing." "The bravery it takes to go into the unknown in a situation like that is extraordinary, and he gave his life for us. So I want us all to keep his family in our thoughts and prayers, to keep his fellow officers in the 102nd precinct and all the NYPD. They are all hurting today," the mayor said. "So if you see a police officer today, please offer their condolences; they feel like they lost a family member, too. " Simonsen, of Calverton, New York, graduated from the police academy in 2000. One officer who was in the academy with Simonsen told ABC News Wednesday, "To his family... I know that no words will ever be able to take the place of the pain you are all feeling, but please know that Brian will never be forgotten, and his brothers and sisters in blue will always be here for you." Simonsen was considered a "great investigator" who was "held in very high esteem by his coworkers," O’Neill said in his Wednesday statement to the NYPD. "This is heartbreaking," O'Neill said, adding, "The outpouring of support we are receiving as a police department is simply overwhelming." O'Neill thanked the doctors and nurses "who fought so hard to save Brian" as well as the "FDNY firefighters and EMTs, the New York State Police troopers, the Triborough Bridge and Tunnel Authority cops and many more, who all stood at attention and saluted in the cold rain as the ambulance transporting Brian from Jamaica to Bellevue Hospital Center in Manhattan passed by." Simonsen and Sgt. Matthew Gorman arrived with other officers at the corner T-Mobile store Tuesday night. The suspected robber, 27-year-old Christopher Ransom, charged at the responding officers with an imitation gun raised, simulating firing at the officers, NYPD officials said Wednesday at a news conference. In a chaotic scene that unfolded within seconds, seven officers shot 42 rounds, authorities said. All of the shooting took place outside the store, with officers flanked on either side, authorities said. It appears Simonsen was caught in the crossfire. Simonsen, who did not have a bulletproof vest on, was fatally hit once in the chest, authorities said. Gorman, an 8-year veteran, was shot once and survived, according to police. 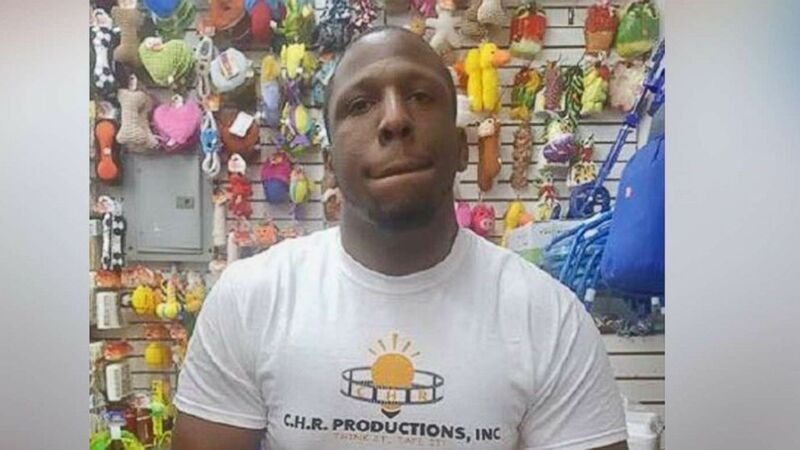 (NYPD) Christopher Ransom, the suspect who brandished an imitation gun while robbing the Queens cell phone store, Feb. 12, 2019, in New York City. A passerby drove him to Jamaica Hospital, where he underwent surgery. Gorman was listed in stable condition, O’Neill said. Ransom, of Brooklyn, was shot multiple times and is in the hospital in stable condition, according to authorities. "Recovered by the police at the scene was an imitation firearm," O’Neill said. 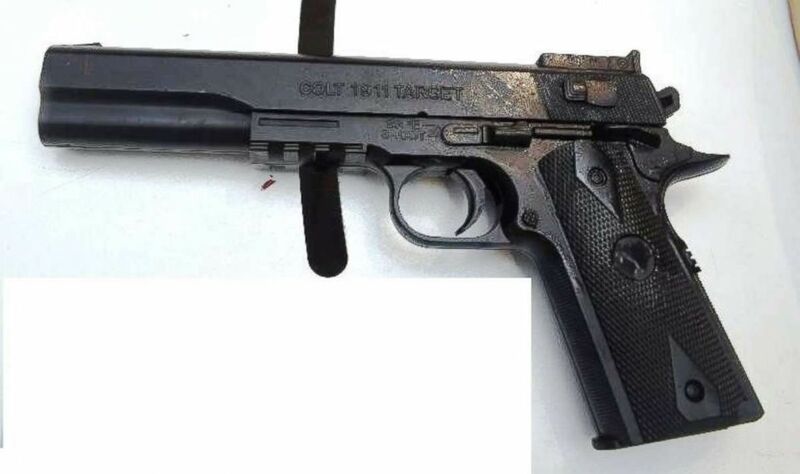 (New York Police Department) The New York Police Department said it found this imitation gun in the possession of Christopher Ransom, who has been charged in connection to the friendly fire shooting death of Det. Brian Simonsen in Queens, N.Y., on Tuesday, Feb. 12, 2019. Ransom is now facing charges of second-degree murder, first and second-degree robbery, assault, second-degree aggravated manslaughter and menacing. Ransom, described by O'Neill as a "career criminal," has eight unsealed prior arrests dating back to December 2010, including petit larceny, grand larceny, criminal impersonation of a police officer, violating an order of protection and resisting arrest. He has never served time in the state prison system. Ransom was also being investigated as a possible suspect in the armed robbery of a RSK3 Wireless store in South Jamaica, Queens, on Jan. 19.